We have been proud to support and be part of the Darnall Dementia Awareness Group. This group, made up of carers and people living with dementia set out to raise awareness of dementia, its impact on the individual and on family carers. Through a series of workshops the group has raised awareness in people in Church and community groups, school and University students. 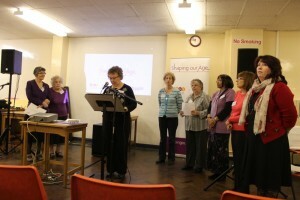 The work of the group in its present form came to an end in November 2014 with a celebration of its achievements and the launch of a new photo- film, made by the Darnall Dementia Awareness Group in collaboration with Sheffield Hallam University. The film, entitled “I might be laughing now” is to be used with students at the University who are studying nursing and other health professions.